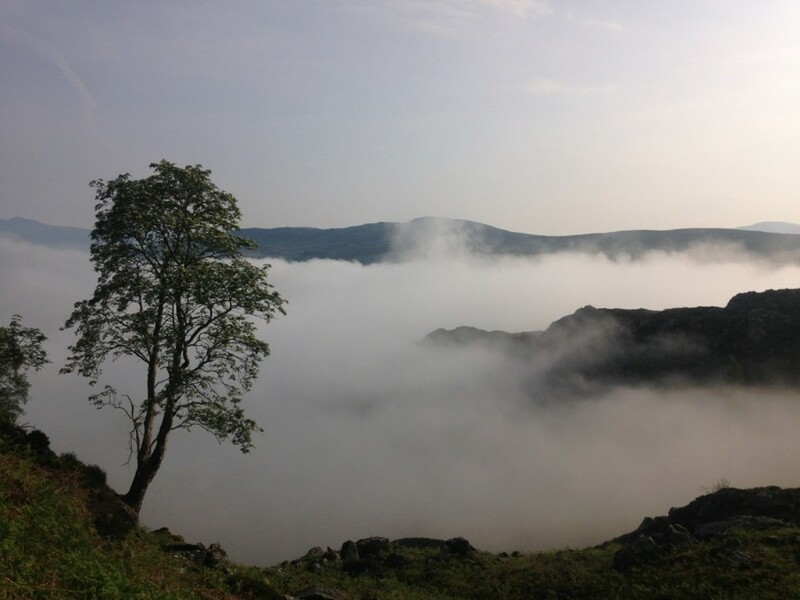 The forecast for late morning was for thunderstorms and lightening with localised flash flooding, so I left my home in Kendal just before 5am, driving through thick mist to the village of Rosthwaite in the Borrowdale valley. I laced up some brand new studs, a recent gift after my Joss Naylor record run, and set off in the muggy early morning heat. It had rained during the night here, deep puddles on the track, and a stench of sheep through the farmyard, black badger turds dotted along the path by the stream. 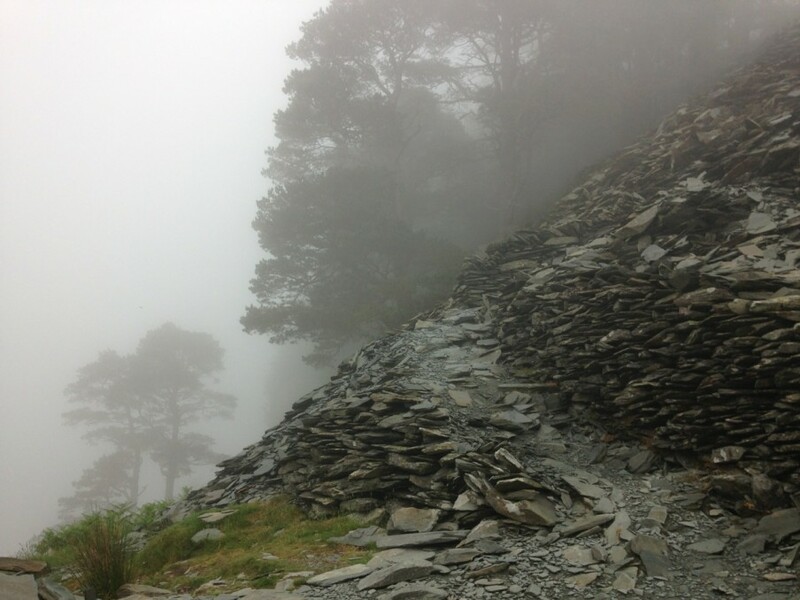 Cuckoos were calling, the zig zag climb through the old slate mine to the first summit of Castle Crag made eerie by the thick cloud. I doubled back, picking up my running pack from my van in Rosthwaite. I may well need my cagoule, map and compass this morning. The early climb was like running through someone’s well kept garden. The path twisting round ferns, boulders and over small dried up streams. 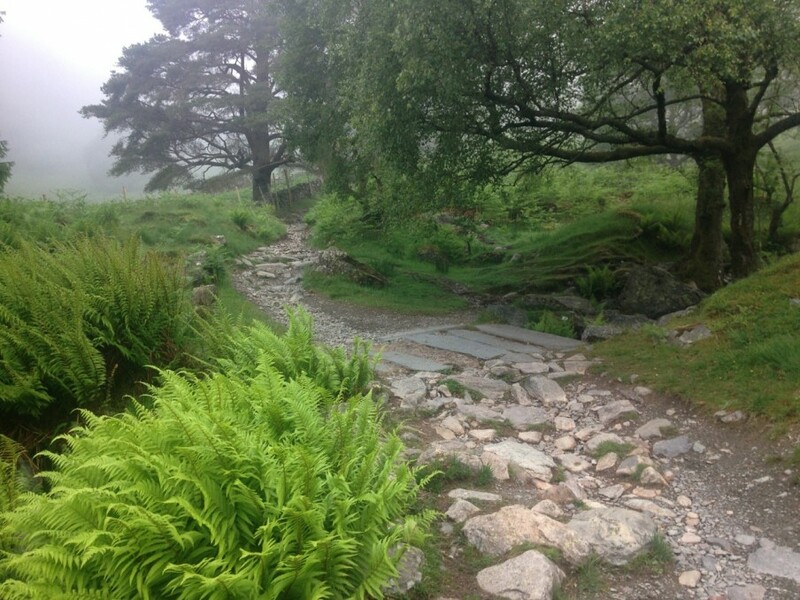 Higher up the washed out trail towards Watendlath, I veered left off the main path along a well worn trod, reaching burnt bracken undergrowth, the air heavy with the scent of a recent barbecue. Pale blue sky the colour of a starling’s egg appeared amongst the white cloud, a rocky knoll marking the top of Grange Fell. 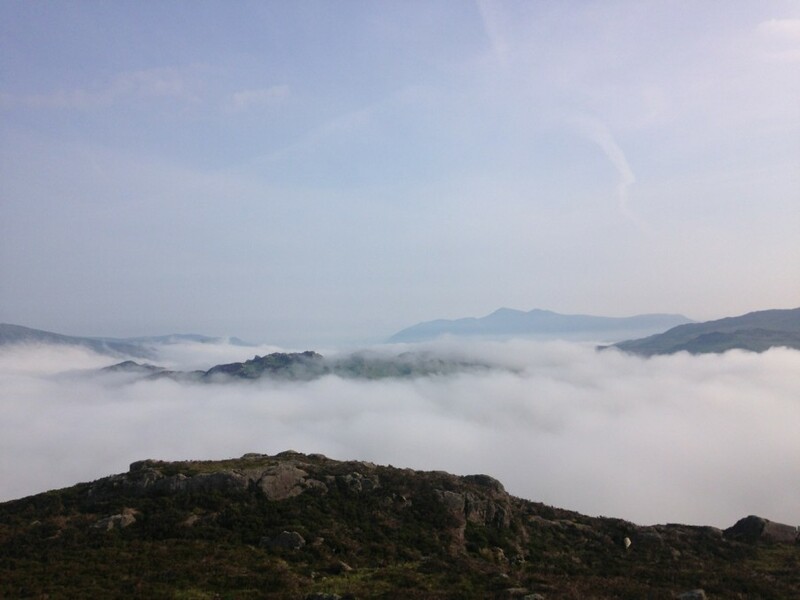 Across the valley, my ridge line of High Seat just above the inversion layer. The bogs were still very wet, despite the recent dry spell, sweat was pouring off me from the humidity, I contoured through the cotton grass towards Great Crag. 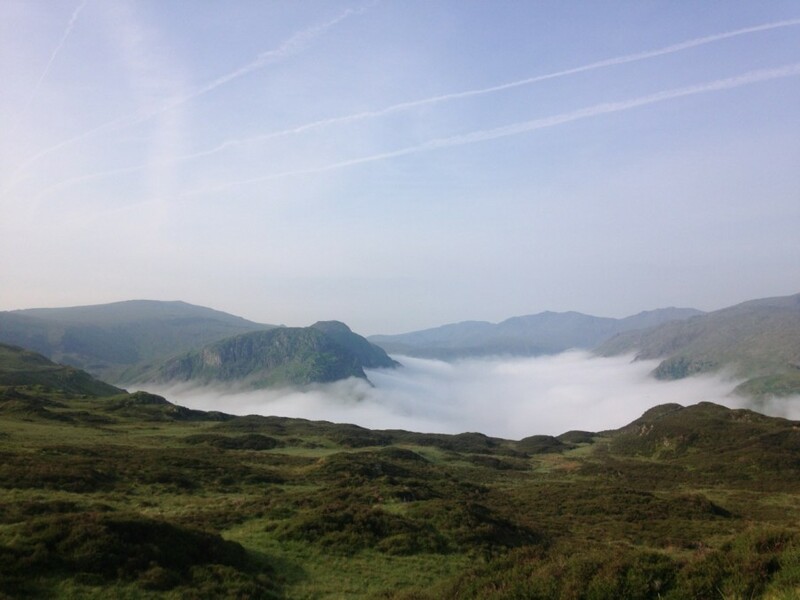 I had climbed above the cloud, the valleys all around a white sea, islands of mountain peaks basking in the warm early morning sunshine. 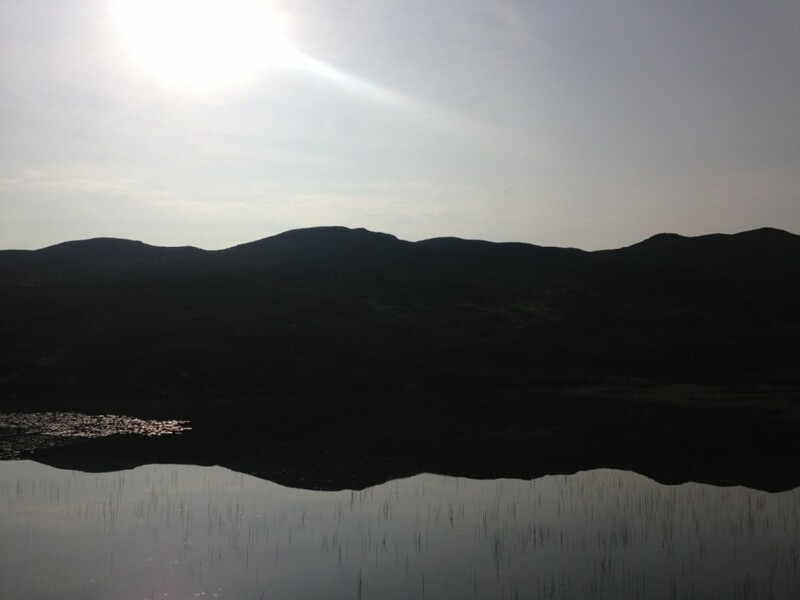 Droplets of water sparkling on every blade of grass, the sky now a gorgeous blue, Dock Tarn a mirror of reflections. Heather, deep tussock grass and wet bog making the going tough work, before reaching the faint trod to distant Ullscarf. These are quiet hills, off the radar for all but Wainwright baggers and nature lovers. Just as I was thinking about red deer, a menacing RAF jet roared low overhead, two deer appeared from nowhere, startled first by the noise of the jet, then by me running towards them. Blea Tarn like glass, then the rounded hump of Armboth Fell, a nondescript peak with views down towards Thirlmere and Raven Crag. Across more wetland to the lump of High Tove, peat hags and deep green man eating bogs on the way to the trig point summit of High Seat. 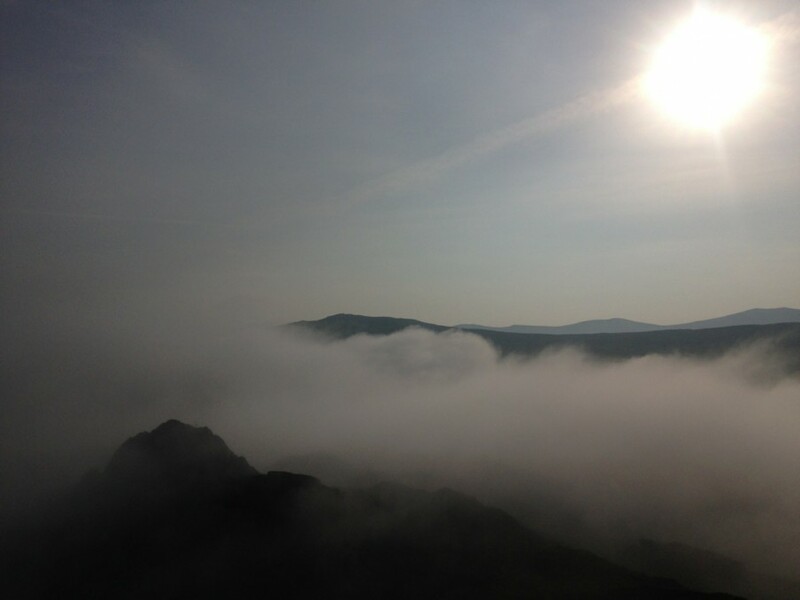 The early morning inverted cloud had now gone, the first thermal clouds were bubbling above the peaks all around. 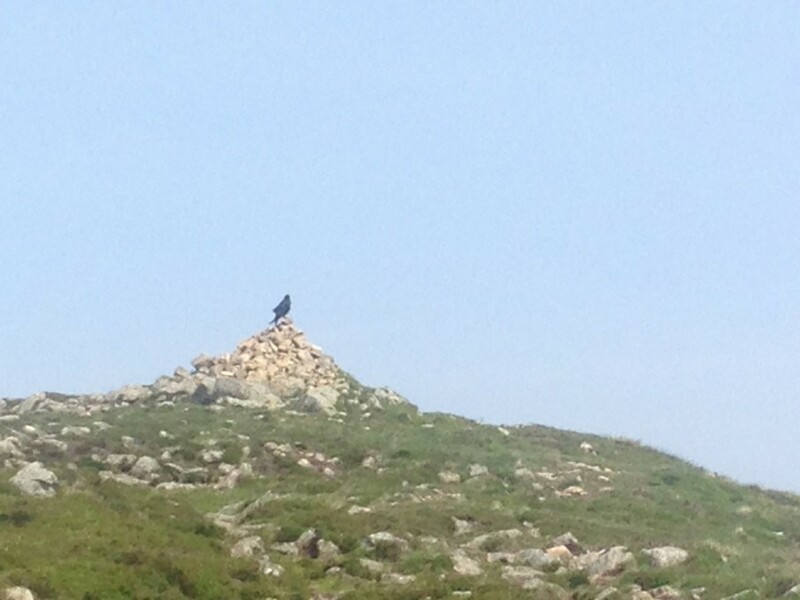 A jet black raven waited for me on the pile of stones near the next summit of Bleaberry Fell, launching with a loud flap of it’s wings and a croak into the still air. 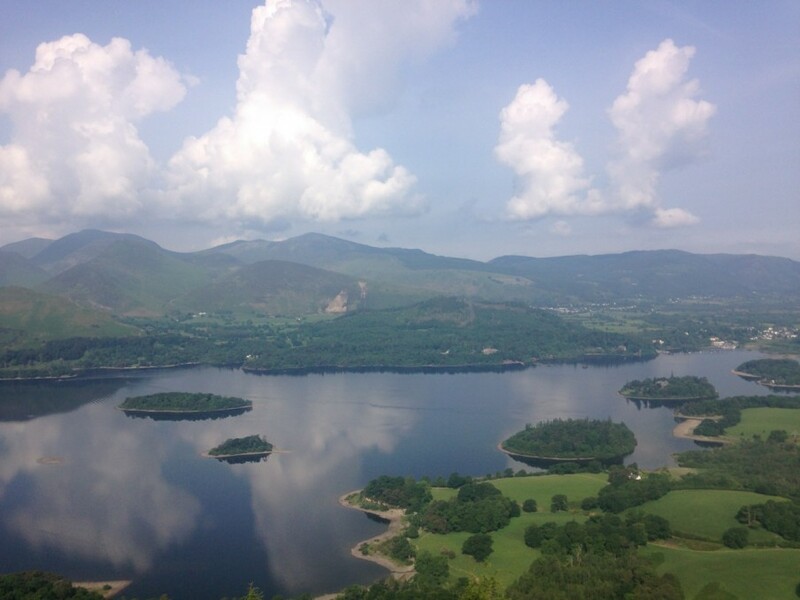 Down by the grassy side of the main path all the way to Walla Crag, Derwentwater flat calm far below. Doubling back and saw my first person of the morning, another runner, making her way uphill and going well, we called out good mornings as we passed by. As I reached Ashness Bridge and splashed cool water on my face, a lady was opening the shutters of the nearby National Trust building. I jogged over and asked her where the Bob Graham Memorial stone was – I’d seen it last night on my map, and wanted to pay a visit. 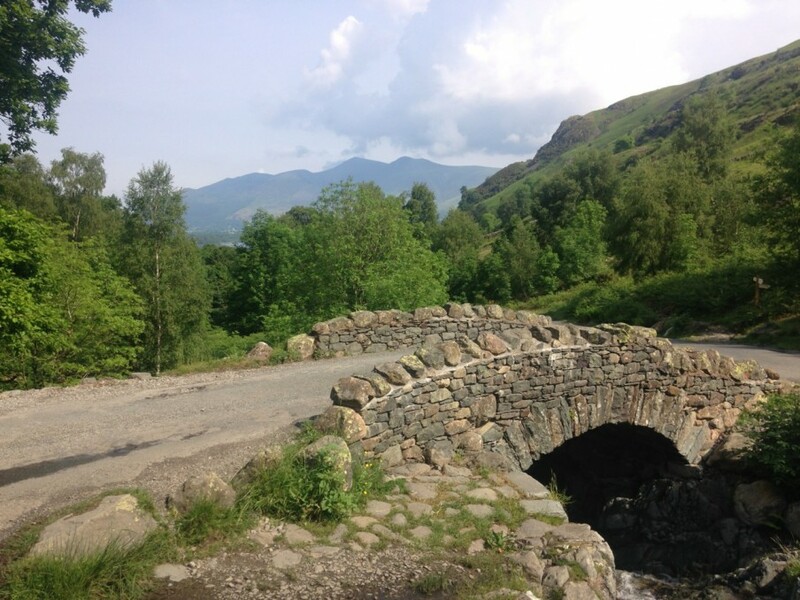 “Over the bridge and follow the stream” I did as suggested, the whisper of a path deteriorated into thick green bracken, and I ploughed my way through it, swatting off the hungry horse flies, back to the tarmac of the road. 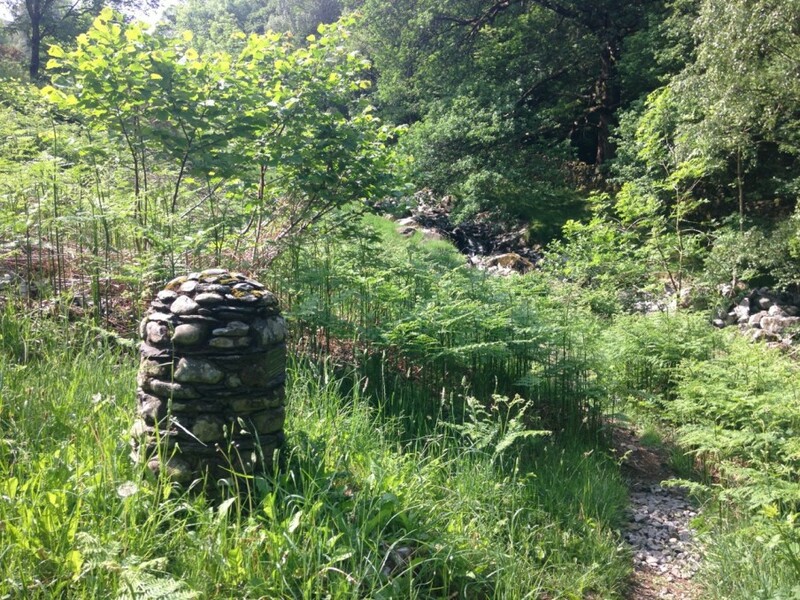 Further down by the roadside, the mushroom shaped memorial stone, like an ink cap, nestled amongst the bracken. I thought two things were strange. 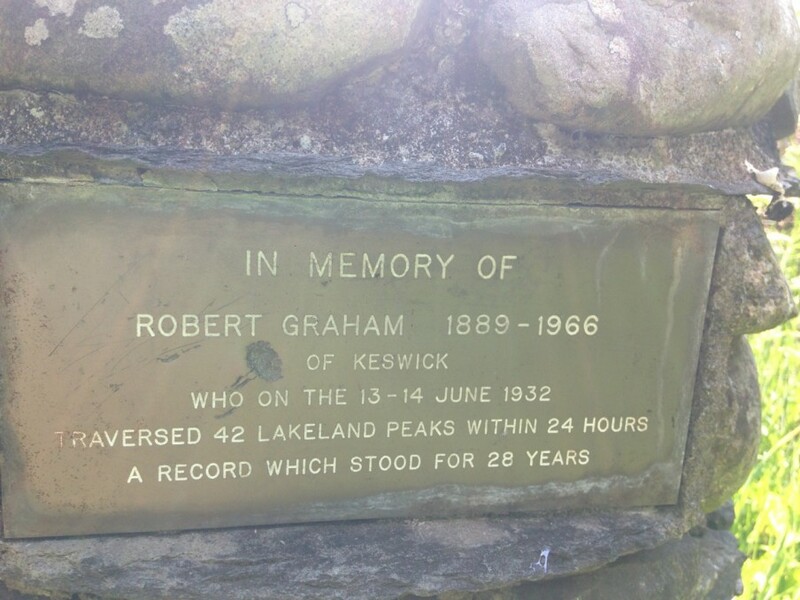 The location, lying as it does nowhere near any of the Bob Graham Round route, and using his full name Robert on the memorial. 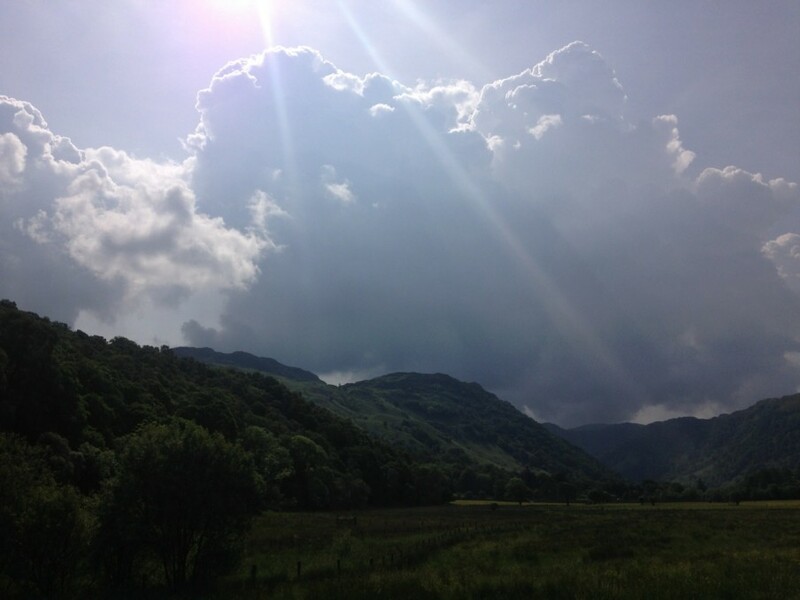 I jumped on my bike, hidden amongst the trees further down the lane, and pedalled back to Rosthwaite, taking photos of the bright yellow buttercups in the hay meadows, a backdrop of towering cumulus clouds overdeveloping all around. 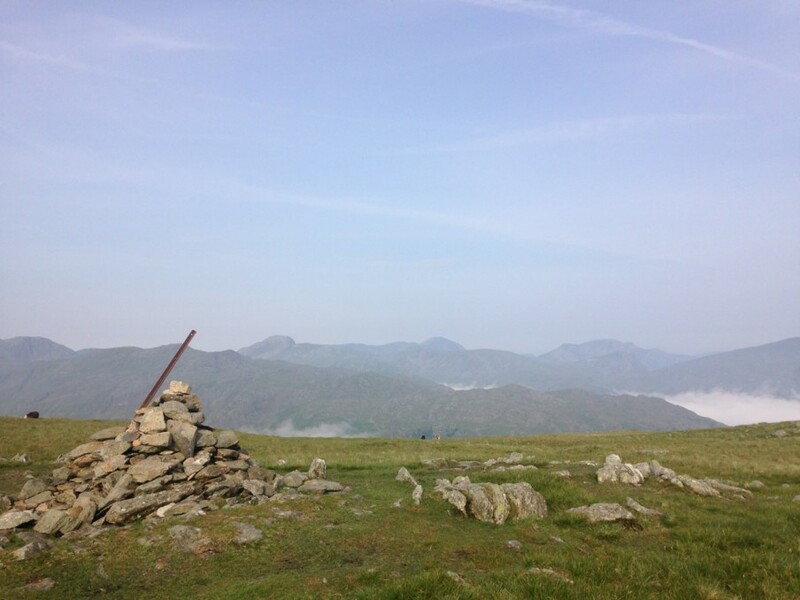 9 Wainwright summits today, that’s 162 down, 52 to go. 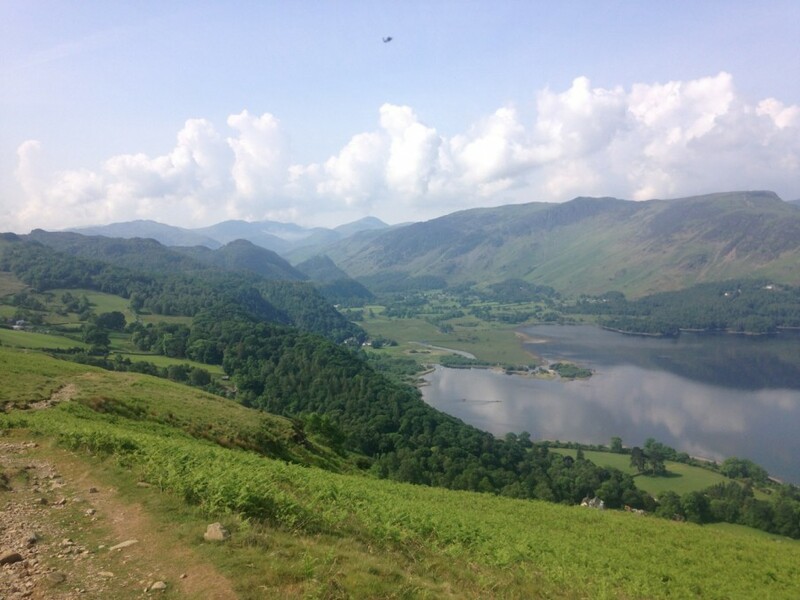 This entry was posted in Best Of, Blog and tagged bagging, Bob Graham, Borrowdale, Lake District, run, running, summit, trail, trail running, trails, ultra, ultra run, Wainwright. Bookmark the permalink.